Medium - $46.99 Only 5 left! She aggressively tries to renegotiate her bed time every single night. She tells you that she doesn’t want to eat her vegetables. She likes to refer to herself as “The Boss”. She tries to use her special headlock move on various members of the house. She refers to the backyard as “The Ring”. She tries to challenge siblings or neighborhood kids to iron-man matches. She wears flashy outfits with an intense amount of attitude. She already has a finishing move. She won’t leave home without her wrestling boots on. She has a mean face. 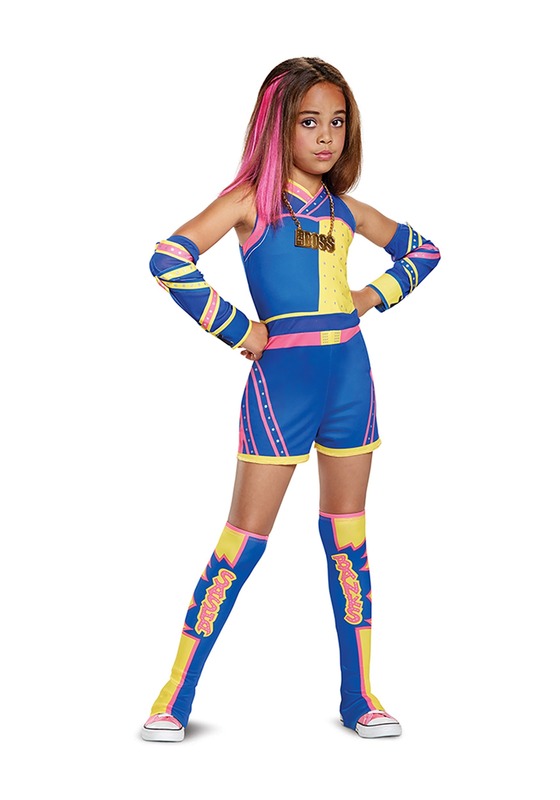 Yes, if any of these describe your girl, then she might just be ready to wear this officially licensed WWE Sahsa Banks costume. The costume comes with a bright blue romper designed to look like Sasha Banks’ signature wrestling outfit. It also comes with a pair of arm bands and shin guards to get the complete look. Of course, no girl can truly be Sasha with her brightly colored hair and her necklace! This costume comes with hair extensions that clip easily into your child’s hair and the necklace has a pendant designed into the shape of the words “The Boss”.